From one "spaceman" to another, William Shatner of 'Star Trek' fame has recorded a video message for the six astronauts living 240 miles above Earth on the International Space Station. "I wish you really good luck, good health, get some good work done, and we'll look forward to you coming back," the actor known for playing Capt. James T. Kirk on the original 'Star Trek' television series said in the video. 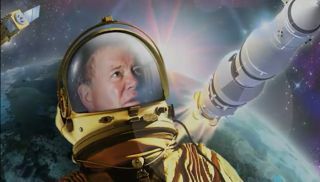 Shatner released an album of space-themed songs in late 2011 called "Seeking Major Tom," which features new covers of classics from David Bowie, Queen, Pink Floyd and others. Shatner sings, along with guest artists such as Sheryl Crow, Lyle Lovett, Peter Frampton and others. Apparently, the current space station crew of two NASA astronauts, three Russian cosmonauts, and a European astronaut from the Netherlands enjoy listening to Shatner's album in their home-away-from-home. "Did you know the crew of the International Space Station listens to my Seeking Major Tom album?" Shatner wrote on Twitter Sunday (April 22). To express his enthusiasm about his new fans, Shatner recorded a greeting for the real-life space men. "Six months in space is a long time, and if you listen to my record, the time will pass by quickly," Shatner says in the message. "Not quickly enough, but you've got so much to do up there." Commander Dan Burbank of NASA is leading the current station mission, called Expedition 30. The astronauts serve about five months in space before being relieved by replacements from among the five partner space agencies: NASA, the Russian Federal Space Agency, the Canadian Space Agency, the European Space Agency, and JAXA, the Japan Aerospace Exploration Agency. Burbank and two of the other current crew, Anton Shkaplerov and Anatoly Ivanishin of Russia, are due to undock from the space station this week and fly back to Earth Friday (April 27) aboard a Russian Soyuz space capsule.